Like the swallows of San Juan Capistrano and the humpbacks of Monterey Bay, the monarchs butterflies that invade Pacific Cove and other California regions are part of state legend. 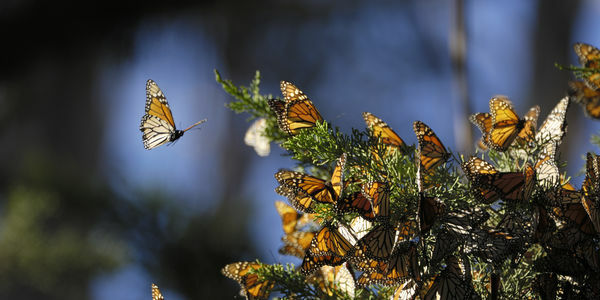 Each year, the "King of butterflies" makes a 3,000-mile trip from as far north as Canada to California and Mexico. Traditionally, they numbered in the millions, filling the air with color and, when they perch on the trees, the swarm's beating wings make the forest look as if it were up in flames. But for the past two decades, the woods haven't "burned" as bright. Each passing year, there are fewer butterflies. According to some studies, the population has dropped by as much as 80%. Part of the reason is loss of overwintering and reproduction habitat caused by a host of problems. Herbicides are killing milkweed— the only food monarch caterpillars will eat— all over the country. Climate change has raised the level of carbon dioxide in milkweed to almost intolerably toxic levels and insecticides containing neonicotinoids have recently been found to negatively affect the growth and survival rate of monarch caterpillars. In a controlled study, doses of neonicotinoid clothianidin as low as 1 part per a billion were enough to affect their size, weight and ultimately their chances of survival. Worryingly, caterpillars are likely to be exposed to rates much higher in the wild as well as come into contact with other types of neonicotinoids. The common pesticide isn't just having an effect on monarch butterflies, but other pollinators like bees and even on migrating birds as well. Its environmental risk is so bad that the European Union has implemented a near total ban on the toxin and Canada looks as if it will follow suit. With monarch butterfly, global bee and bird populations plummeting, nations need to step up and get rid of the chemicals that are helping to push these important animals to the edge of extinction. Not only do they have the right to exist, but we cannot live without them. It's time our government realized that no pesticide is worth the loss of the amazing biodiversity that shares our planet. Please sign the petition and encourage the Environmental Protection Agency and state governments to ban neonicotinoids today.